This time we'll talk more about the Mission. Hi young gods! Rick's back, baby! We've talked a lot about the internal development of your religion: choosing God Commandments, powering up your Disciples and developing your Rituals. But to really achieve greatness you must touch the outside world: send your Disciples to travel the world through the Mission! The world of Godhood is a mythical place filled with nature spirits, fabled creatures and deities much more ancient than you. During Missions your Disciples will travel to other tribes, who worship rival gods, to prove your superiority and convert their worshippers to your cause. 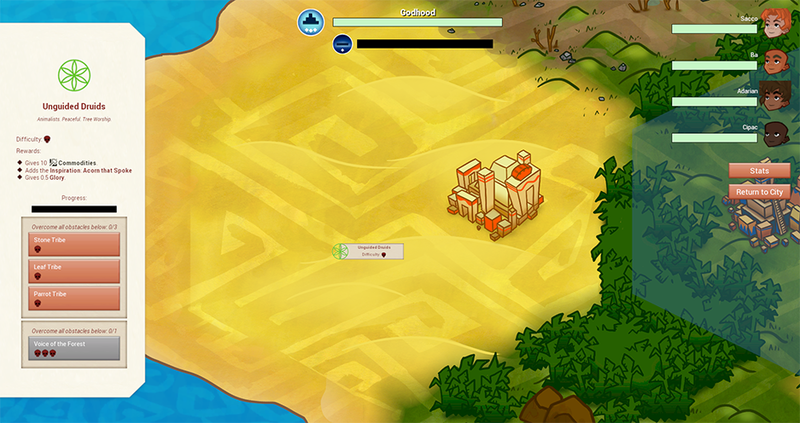 You choose the Mission's destination on the world map, which is procedurally generated and seeded with unique challenges each playthrough. 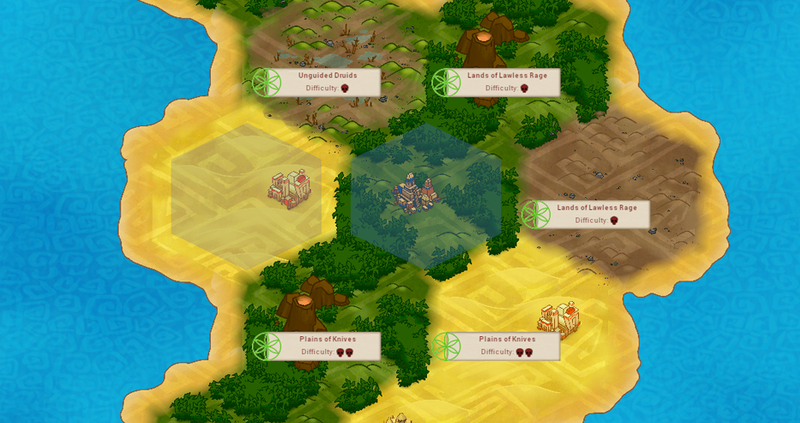 The tribes surrounding your Holy Site are each defended by different groups of Disciples, and will reward different resources when converted. Your selected team of Disciples will have to challenge several teams of enemy Disciples, retaining damage taken from one to the other. Each victory grants you rewards, and defeating the final Sacrament in a region causes the tribe's conversion. You can launch new Missions from a converted tribe's location: allowing you to explore further and encounter more powerful gods and tribes. Converted tribes will also pay tribute to you (especially if their culture matches your dogma) for which you'll no doubt bless their crops and such.. right? Converting a tribe requires a balancing act between sending the right Disciples to exploit enemy weaknesses and knowing when to give up and cut your losses. Defeat could leave your Disciples disheartened, and with lowered Faith. When I sent my Disciples out to a nearby tribe of druidic tree worshippers, their first team assaulted my followers with beautiful songs about the greatness of nature. Luckily my Disciple Cipac, with his high Wisdom stat, could resist these untruths while Marala the Rage Prophet convinced them of my greatness through old-fashioned skull-cracking. Since Cipac's Spirit (HP) was lowered considerably, I switched him out with a much less experienced Disciple. This proved my downfall in the next challenge, when an enemy Weaver easily defeated them with his strange spells. While conversion and resources are great incentives for any enterprising god to launch a Mission, there are two more: Glory, and your Godhood. Glory is a measure of how great your worshippers believe you to be. The more Glory you have, the better your Disciples' Faith in you and the better they perform their Rituals. You gain more and more Glory the more Sacraments you manage to complete within a single Mission. However, just like my hairline, Glory fades over time. This is important, because once you are out of Glory, your Godhood will vanish! Godhood is your godly power, and once it is 0 your worshippers forget your dogma, your radiance, and your existence altogether; you lose the game. Explore the world, choose your Missions wisely, pick the right team of Disciples, learn your opponents weaknesses so they might be exploited, and always keep an eye out of maintaining your Glory and Godhood. Soon the map will be dotted in your colors, as other deities drift into forgotten nonexistence! And with that, I too will drift into my own forgotten nonexistence! Which actual Mesoamerican deities do you hope make their way into the game as adversary deities? Let us know in the comments! If you have any questions or insights in The Mission or next time's topic, The Big Idea, let us know in the comments! I think Glory is a brilliant mechanic. It incentivizes and empowers the player to continue winning as fast as possible and discourages boring strategies like waiting and turtling. 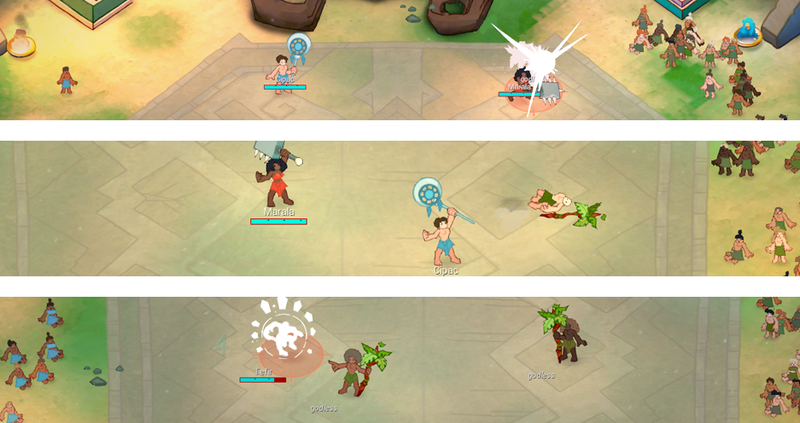 Losses feel dangerous because they derail the pain train, and taking a loss forces the player to reconsider their strategy. Yet even if they lose sometimes, they gain some permanent advantages from the Missions they do complete, which will help them recover. I'm worried that losing too much Glory will lead to an irrecoverable spiral (can't win Missions without Glory, can't gain Glory without Missions), which feels terribly frustrating. What options does the player have when they become "stuck"? As long as games of Godhood are not too long, players could take the loss and start over without too much pain. Or maybe there could always be easy Missions available, so the player can recover some glory? That could drag out the game too long... It depends on whether you want to make a fast-paced game (when the player is going to lose, they lose quickly), or an epic game (the player can always win, even if they have to struggle). Happy to hear your take ChiefOluk! We've recently been testing the mechanic a lot and are very aware of that danger; we're tweaking the numbers a lot to make sure the player never finds themselves in such a death spiral. The main thing to know here is that while Glory is really good to gain, as it allows for a more productive period of rituals and prayers before doing another Mission, it is not so important that your entire game hinges on it. It buffs your activities rather than solely determining their success. It's also not possible to 'carry over' Glory from one Mission until after the next, so the player will only need to perform one solid Mission (perhaps picking on a smaller deity somewhere) to get a good 'high Glory season' back. Hope to hear your insights again sometime Chief!